Radiator Maintenance: Have You Sprung A Leak? Your vehicle’s radiator is front and centre; just behind the grille, this engine part occupies an important position because it fills an important role. During normal function, your engine pumps a fluid through the radiator– this is known as coolant and it does just that: cooling off the vehicle so it can operate normally. If your radiator is leaking, it means you are losing coolant and sacrificing efficiency to an easily fixed problem. First things first, you need to know how to spot the warning signs of a leaky or defective radiator. Read on for Park Muffler’s guide to basic radiator maintenance! Overheating: if your vehicle stalls and steam pours out from under the hood, it has overheated– a common result of a damaged or faulty coolant system. 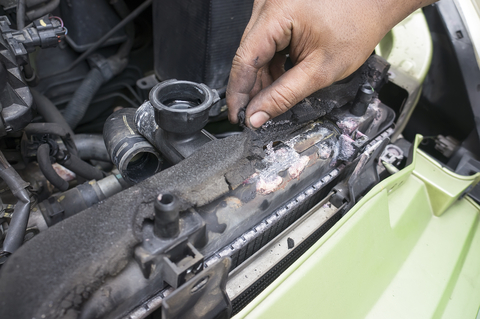 Corroded & discoloured: leaks often build up around joints, hoses and other seams in the coolant system– regularly check the radiator and its connected parts for any evidence of leakage. Steam: checking under your vehicle while it is still warm from running can help identify a leak’s source– as coolant leaks out, it steams off of hot components. As you can see there are several factors that could help a vehicle owner prevent or reverse a coolant system leak. The key to keeping your vehicle on the road is preventative maintenance– if you notice any of the above, bring your issue in to Park Muffler today! Our expert techs are standing by to assist you in any way we can.